Laparoscopic surgery is a sub specialization of surgery and gynaecology and involves the use of an assortment of equipment and electricity. It is not for everyone. It also has its own inherent complications such as perforation, bleeding, infection, thermal injury and carbon dioxide narcosis (extremely rare). 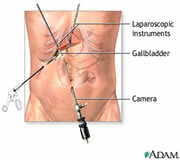 This modern form of surgery is now offered at a few specialized medical centres such as AVLSC both in Lagos and Abuja. Laparoscopy is a major part of Minimally Invasive Surgery which involves making much smaller incisions for the same surgical operations that have been performed for centuries. The days when the surgeon made big incisions to accommodate his/her hands in the abdomen/thorax/pelvis are now numbered. We employ the marvels of modern science in the form of a laparoscope which is a small tube-like device with lenses like a telescope to magnify body structures, a powerful light to illuminate them and a miniature video camera at its tip. Exceptionally clear images are now transmitted through a fibre optic cable to a TV-like monitor with magnification much better than the naked eye. The surgeon actually sees much better with small incision laparoscopy than with large incision naked eye open procedures because of the magnification. 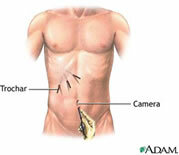 The entire surgical procedure is easily recorded on a simple video tape which can easily be burned down to a DVD. Similar small straw-sized laparoscopic instruments are used for cutting, suturing, coagulating, irrigating, ultrasound and much more.